For more than 70 years, the Rubbermaid brand has represented innovative, high quality products that help simplify life. From its original line of durable house wares, Rubbermaid has developed a major presence in categories ranging from home and garden to seasonal and commercial products. Rubbermaid containers and Rubbermaid trash cans are one of the best known products that Rubbermaid has in their vast line of consumer product solutions. Rubbermaid is a leader in developing high-quality, innovative storage and organization solutions for the home, business and outdoors. Rubbermaid designs and manufactures a full line of consumer and commercial food storage containers and beverage dispensers, as well as products to store goods and keep homes, closets, garages and outdoor living space clean and organized. Rubbermaid containers and Rubbermaid trash cans are of the highest quality, offering consumers excellent solutions to their storage and waste disposal needs. 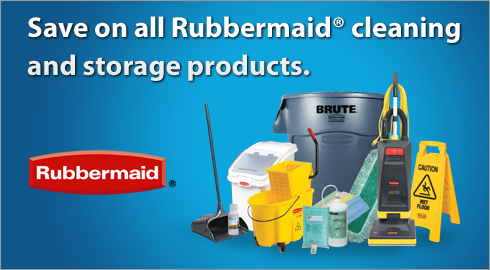 ReStockIt.com carries thousands of Rubbermaid products at warehouse prices....everyday! From Rubbermaid containers for food storage, outdoor sheds for storing garden tools to Rubbermaid trash cans and recycling containers, ReStockIt.com has the best priced Rubbermaid products for all of your business and home needs. Save on Rubbermaid Containers and Trash Cans!